It sure seems like Russia has been winning a lot of late. If you want to get on that winning team then maybe today’s Nice Price or Crack Pipe Lada VFTS will be the way to go. That is, if its price isn’t a loser. That’s what I’m talking about! Yesterday’s 1974 Mazda RX4 wagon may have been down, but it was certainly not out—not with all of you in its corner. A long many-winters’ nap made that Rotary Wagon rusty and moldy, that is true. However, with a price under a grand most of you didn’t care and it came up with an overwhelming 85% Nice Price win. Also, stock prices for Clorox and POR15 ticked up noticeably overnight. Do you own any objet d’art? You know, a bauble that pleases you, perhaps with its aestheticism despite lacking much in the way of functionality? Perhaps it’s a ceramic Dalmatian posed near your front door, or a Democratic candidate for any office in the South. Take your pick. 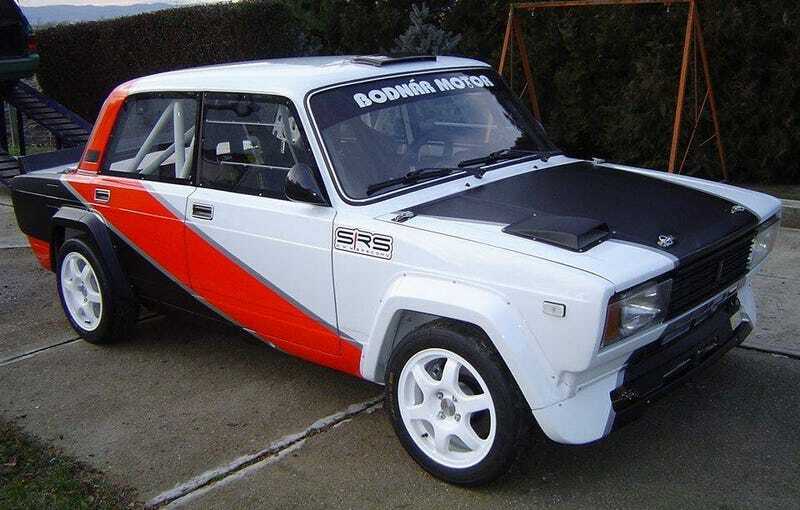 Unless your jam is vintage rally racing, today’s 1987 Lada VFTS may just be such a bauble. Before we get into that however, just what the hell is a 1987 Lada VFTS, right? Well, the VFTS (Vilniusskaja Fabrika Transportnyh Sredstv) is a rally racer based on the Lada 2105 which itself was based on the Fiat 124 sedan. The cars were constructed at Vilnius Lithuania and first received FI homologation certification in 1982. This one is claimed to have been made fresh in 2016, and to be the only VFTS in America. Being as wacky as it is, it may not surprise you to find that the part of America it calls home is Miami Florida. The build centers around a 2-litre SOHC Lada four rocking a pair of Weber 48 DCOE side-draughts, and a whole lot of shiny bits. The engine bay is seriously pretty, although just between you, me, and the lamp post, I think it’s probably over-carb’d. The rest of the car continues the beauty parade. It’s clean as a bean both top side and below the equator, and does look to be fully kitted for rally work with a 16-point cage, five-point harnesses, brake proportioner, and a dogleg five-speed. The body is said to have been lightened to just under 1,900 pounds, a feat accomplished by tossing pretty much the entire interior, along with much of the glass—replaced with plexiglass—and all the bumpers and trim. Added-on in replacement is a pretty nice-looking set of fender flares wrapped around Speedline alloys and fat tires, as well as a rubber duckie in the back. In fact, the only thing this vintage rallier seems to lack is a set of spider eyes on the hood or roof. Other than that, it seems at least daytime rally ready. Ah, but would anyone be ready to actually rally it? taking it out on the dirt would certainly mess up that pretty, pretty undercarriage. And of course driving it on the street will be a big fat no-no. So what would you do with such a ride? Well, before you answer that, let’s consider the $40,000 asking price for this extremely rare unitasker. Yep, forty gees, a bunch of Benjamins, makin’ it rain, cold hard cash. That’s a lot of dough. Now, if you’re a wealthy collector, you might not bat an eye at that price. I saw somebody drop something close to that for a fiberglass Deuce at Barrett-Jackson a couple of weeks ago, and it kind of freaked me out that anyone had that kind of cash to so blithely spread around. Most of us are living in a different plane from that and hence can only buy such cars in our imaginations. In my imagination, I’m also a little bit taller! We still can judge our financial betters, and hence it’s now time for you to vote on whether this Lada is worth that $40K. What do you think, is this VFTS cool enough to command that kind of C.A.S.H.? Or, is this a rally car with a DNF price tag? Miami FL Craigslist, or go here if the ad disappears. H/T to sdiglesias for the hookup! Rally Around a Saab 96 for $6,750!